In what is set to become a weekly event, Egyptian Twitter users gathered once again for a second round of their twitter-simulating discussions known as Tweet Nadwa [ar] (forum). 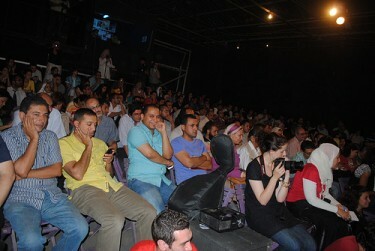 After a successful first round that focused primarily on addressing the issue of Islamists, how they were perceived in Egyptian society and how they envision post-revolution Egypt, the second round, held in the downtown theater of Rawabet, went back in time to discuss the roots of the Egyptian revolution. Unlike the first round, whose speakers were of an Islamist background, speakers this time were left-leaning, especially people like Hossam El Hamalawy and Wael Khalil who are part of the bloc known as the Revolutionary socialists. In 90 minutes, these speakers recalled their experiences with street activism in Egypt that was rekindled following the Second Palestinian Intifada, revisiting important events and dates, such as support demonstrations and labor strikes, that accumulated and culminated in the Egyptian Revolution. Each speaker focused on a certain sector of activism; while Khalil spoke about the activities of the Popular committee for Supporting the Intifida, El Hamalawy went through the struggle of the workers, listing important dates where workers’ strikes were pivotal in popular agitation. Asmaa Aly’s main focus was on the Youth for Change movement, an offspring group from the Kefaya movement (The Egyptian Movement for Change), and how they used blogs as well as street activism as tools to get their message of change across. Finally, Kholoud Saber discussed student activism during the first years of the millennium amidst a fierce crackdown on students from State Security. The second half was more interactive with attendees taking part in the discussion, giving their feedback on what they heard and discussing ways of developing the tweet nadwa momentum to action in the streets. In addition to the hashtag #tweetnadwa, an account was created with the same name, mostly quoting speakers and attendees and updating Twitter users who were not able to participate in person. Here are some positive and negative reactions on the second tweet nadwa. I provided photos of the event, while Ramy Rizkallah produced a video-wrap up of the Nadwa. Alaa Abdel Fatah, founder and moderator of Tweet Nadwa, has confirmed that there will be a tweet nadwa held in Alexandria on the 29th of June that will discuss human right defenders in Egypt.